Nostalgia is a hell of a marketing technique. It, as a concept, can be sufficiently disaggregated so that each person’s experience is both universal and personal. Lots of new media relies on the unreachable past. There exists, as I’ve written about before, a term called sonder, which means nostalgia for a time not one’s own. Midnight in Paris captures this feeling to the letter, and commodifies it so that its message can be bought and sold by the very people it aims to placate with dreams of subservience to the artistes de La Belle Époque. Nostalgia is also overwhelming. Instead of inspiration, nostalgic media inspires selective memory, further confusing past narratives. Drowning in nostalgia is akin to a drug-induced coma. Here’s the trick for those who insist on capitalizing on it: rinse and repeat. People will become nostalgic of their own nostalgia. That’s where, in 1973, George Lucas sold middle-aged Boomers on a “better” time, some ten years earlier, before fake war and realpolitik took generations of Americans to dirt futures. The concept is bizarre, because presumably these very Boomers lived this era, perhaps not as wantonly as the four underdeveloped kids, but they very much existed and had formed their own memories of 1962. Remember, 1962 was the apex year of postwar prosperity for an average American kid. The question for Lucas and his producer, somehow Francis Ford Coppola, is not what they should write the movie about, it’s who is this movie for, exactly? Was it a dopamine insult for Americans who couldn’t stand having family and friends napalming Cambodians and systematically picked off near Hanoi? Was a movie going to suddenly placate the hippies? The answer, in short, is totally, absolutely, and exactly. Here’s a mind-blowing number: in 2019 dollars American Graffiti would have made $800 million on a budget of just over $4 million. This movie made an overwhelming amount of money selling a truly empty version of American Life. The takeaway from this diatribe is that the success of American Graffiti is that it allowed George Lucas the financial freedom to expand his studio and make Star Wars. And no one today is forcing young Americans to watch American Graffiti at all. It’s not a regular play on any cable channel and holds little sonder value. The stakes that propelled this movie to success seem neither high enough nor deep enough to lend it any weight to today’s audiences, whose young people have seen so much grief inside and outside their classrooms that their 1970s counterparts never would have forgotten what they were fighting for when they sold out free thought for expensive numbness. 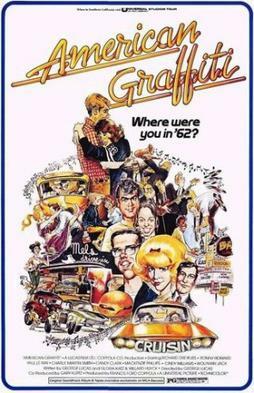 For all its similarities, American Graffiti is not proto-Superbad. For one, Superbad did not doom its normie cast to death and obscurity to make a vague point about nihilism. Superbad did not ask its audience for introspection on the back of flimsy fate. In this way, American Graffiti is not only intentionally misleading but also intellectually bankrupt – at least the propaganda films during World War II exhibited some sense of self-awareness. Theater owners would often open screenings with “Support Our Troops” messages, and then the films would be about mothers and wives finding unbelievable amounts of strength to keep families together. Talk about ubermenschen. In this way, escapism in film is only intellectually fair if the audience knows what its filmmaker’s perspectives and goals are beforehand. We do not buy a loaf of bread expecting pre-made sandwiches and then become excited with our sliced loaf. That isn’t how shopping works. Let’s pretend for a second that the audience did, in fact, want sandwiches pre-made. Then why sell it bread? Because the studio knows that the audience will eventually want to know where it sourced its bread. Even if the wheat was milled a long time ago. This type of emotional lampooning is never going to stop, even if or when a very large pot of money becomes aware of its existence. There’s always another pot of money; there’s always another group of inconsequential teens to replace the lost bunch. Unlike Superbad or The Goonies, even, American Graffiti exhibits no warmth toward its cast of characters, who could have more honestly have been interchangeable with one another. Perhaps this disambiguation was meant to be freeing, but it comes across as cruel. God forbid Lucas mentions any of his female “leads'” fates before rolling credits and racking up cash. Not that a movie can’t just be fun: at least we got the prequels. But this one is not it. Nineteen seventy-three’s winner, The Sting, also trapped its audience in a time not its own. The year was truly an odd one out: along with American Graffiti and The Sting, audiences also Cries and Whispers from famed Swede Ingmar Bergman, The Exorcist and …A Touch of Class? This is an obvious win for The Exorcist in retrospect, if not for the Academy’s non-ironic fear of horror. With that and with two Godfather wins sandwiching 1973, The Sting will always be relegated to trivia hounds and overthinkers. We can hope American Graffiti stays forgotten.